Lake Tarpon, the "Jewel of Pinellas County" is located about 10 miles West of Tampa in Palm Harbor and Tarpon Springs Florida. This 2,500 acre lake provides recreation and enjoyment for thousands in the Tampa Bay area. You can visit Lake Tarpon at Anderson Park, Chesnut Park or several other public access points listed on these maps. Never feed alligators - they lose their natural fear of humans! Eliminate the use of fertilizer or only use liquid fertilizer - it makes the lake GREEN, too! Please patronize our sponsors - it helps pay for the site hosting - Thank you! New Radio station for North Pinellas! Sponsors and donations needed! WZIG 104.1 FM is on the air! 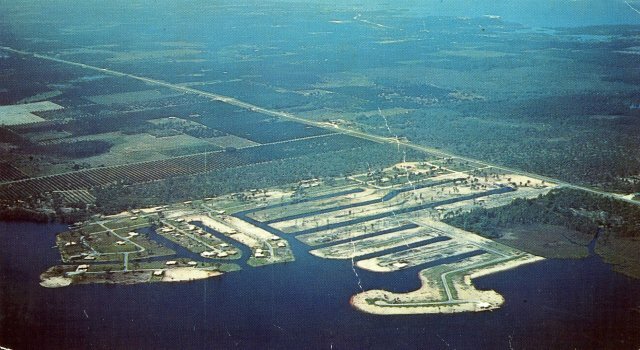 …and it’s based on Lake Tarpon! It’s non-profit, non-commercial, locally owned and operated. …and it’s run by a dog. Yes, a dog. ...and the dog likes his own genre: EXTREME VARIETY - try it! Bumper stickers are here! Bumper stickers are here! 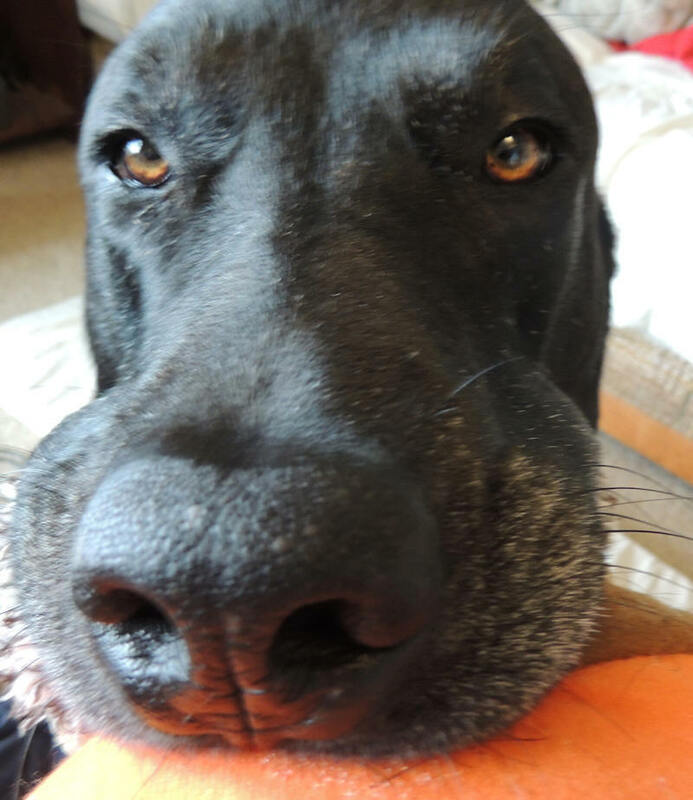 Get one with a donation online or $2 if you buy from Ziggy, the station’s goofy Labrador Retriever mascot, who often visits Snappers Grill and Comedy Club (US19 and Oak St). These stickers are the kind that come off easily and are popular on rear windows. WZIG is looking for community programming producers! Want to be on the radio by producing programming that benefits the community? (boating safety, community issues, local artists, etc.) – see WZIG.org . Lake Tarpon Bait Tackle and Rental has opened up at the Boat and Motor Superstore, 36851 US Hwy 19 North Palm Harbor FL 34684 (727) 551-1113. It's at the corner of US19 and Citrus Drive, entrance directly on US19. Stop by and take a look! Marina Re-opens - fuel once again available on the lake! The marina (formerly known as Fischer Marine) on US19 just north of Dolly Bay is open once again and they have no-ethanol 90 octane fuel. Gulf Coast Boat Sales also has boat rentals, boat sales, snacks, beer and wine. Their number is 727 841-8811 and the address is 37517 US 19N Palm Harbor. 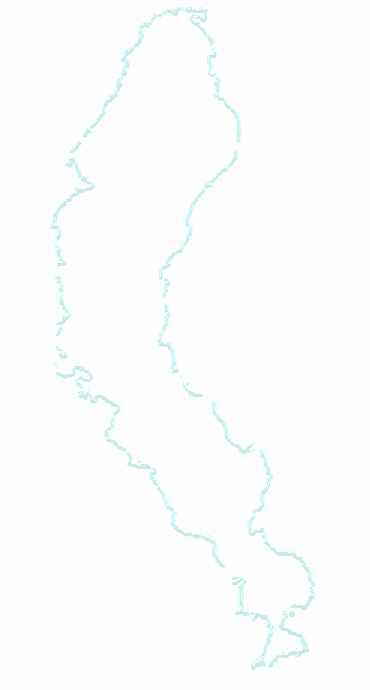 Take the canal just north of Dolly Bay to the end. Dolly Bay is on the West side of Lake Tarpon somewhat in the middle - see the maps for more info. Hours M-F 9-6, Sat and Sun 9-5. Pinellas county will stop spraying residential canals for some nuisance vegetation effective immediately. See pinellascounty.org/laketarpon for more information. The state (SWFWMD) will treat FLOATING vegetation on the lake and in the canals. They will also treat Hydrilla, if notified. However, the predominant nuisance plant in Lake Tarpon is Pondweed, for which there is no local or state funding for. It's up to the lake residents to obtain a permit and contractor to treat this on their own. Contacting your state and federal representatives may help change this. The Pinellas County Commission has passed an ordinance limiting fertilizer sales. This will help extend the life of Lake Tarpon and all lakes in Pinellas County. If your lawn is lush and green on the shores of Lake Tarpon or within ½ mile of the lake, then you are contributing to the health decline of the lake. Please limit fertilizer to a minimum and tell your homeowner association to change the rules on lawn care. Using LIQUID fertilizer helps limit runoff, as it is more quickly absorbed into the grass. George Medders' Lake Tarpon Fishing Report - Click here. The St. Petersburg Times Fishing Guide (340KB) is here. A printed fishing guide is available on Amazon. Get a fishing license here. Water level, quality, clarity and other interesting data on Lake Tarpon are on the Pinellas County Water Atlas site. Take a look! Lake Tarpon Management Plan Updated January 2006 - Download here (2MB). Here is a sample: "Due to historically excellent water quality and healthy fish and wildlife populations, the lake has served as an important recreation resource. However, anthropogenic eutrophication of the lake increased rapidly in the 1990s." In my opinion, this means that Lake Tarpon will quickly lose it's sportfish and water quality will decline unless we stop the nutrient runoff into the lake. This means building more retention ponds to capture runoff and initiating an education campaign to stop residents from fertilizing their lawns (at least stop using granular fertilizer; liquid goes into the ground faster and can't easily be washed into the lake). Fertilizer adds excess nutrients to the lake and accelerates the health decline. How will water quality be preserved? How will user conflicts be resolved? Will Lake Tarpon end up like Lake Apopka? What does Anabaena look like? Lake Tarpon as a water source - full report here. This project is moving forward. Water that would normally discharge into the bay may be captured for reclaimed or potable use. Restaurants on the Lake - See the maps for locations. Additional Chesnut Park Information, Detailed Environmental Maps, More Tarpon Springs Information and more pictures. 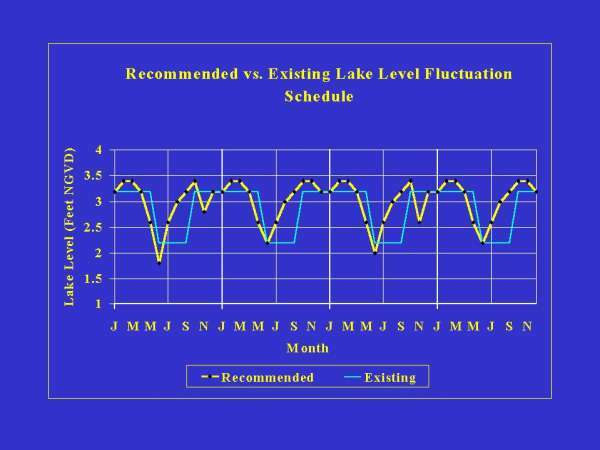 Updated lake level fluctuation plan. Good for the lake and it won't go nearly as low as the Spring 2000 drought. Where is Lake Tarpon? It's shown at the top end of US19 on this Map. 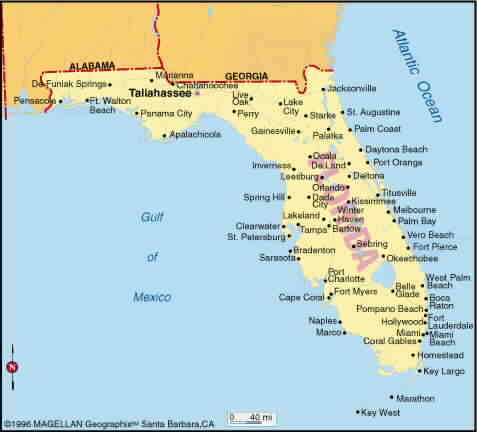 Tampa Florida is on this Map. Maps of the lake, including gas, food, lodging, boat repairs, and more! Lake Tarpon Christmas Parade Pictures: 2007, 2006 and 2005. Fishing: Reports, regulations, Fishing Licenses, Guide and lodge: Florida Fishing Adventures - Captain Gene Zamba (727-938-8186) and his excellent fishing report, George Medders' Guide service and Fishing Report 727-237-7033. Camping: Clearwater KOA 727 937-8412. It's not directly on the lake but very close by. Cypress Pointe Campground was closed and developed into single-family homes. Lake Tarpon Resort 727 942-0358 (formerly Best Western), located down the canal just North of Dolly Bay. Docking on canal to lake. Closed: Dockside Sports Bar and Grille 727 934-3700 (formerly Hemingway's) - part of the Lake Tarpon Resort. Repair and towing - Tarpon Lake Marine - Gary 727 938-1164, 938-6276 Keep this number on your boat. Vegetation - Desirable, Undesirable, What are those weeds caught on my prop? Who sprays to kill weeds? Lake Apopka - a eutrophic lake (prematurely aged with poor fishing) This is what will happen to Lake Tarpon if we keep putting granular fertilizer on our lawns. Use liquid fertilizer if you have to fertilize at all. Zoning/Land Use battle: How Cypress Pointe Campground didn't become a Walmart or Home Depot - it's now single-family homes. Here are the details of now-defeated Walmart proposals. Lake Tarpon's original name: Lake Butler Look at this St Pete Times article for the full story. Lake Tarpon is named after the city of Tarpon Springs, not the fish. In 2003, manatee reportedly come into the lake over the dam. Here is more information. No one else has confirmed this and no reports since then. If you have any material or ideas to contribute, please to email Paul. Photos of Lake Tarpon activities, especially historical ones, are cheerfully accepted. Created September 11, 1997. Last update November 2015. This site is privately maintained and does not represent any government or commercial entity. All pages and photos are copyright 1997-2014 Paul Kempter unless otherwise credited. Please ask to use photos - they contain watermarks. Licensing terms available, usually free for personal/non-profit. Please verify all information independently before taking action - accuracy or completeness is not guaranteed. Some content is personal opinion.